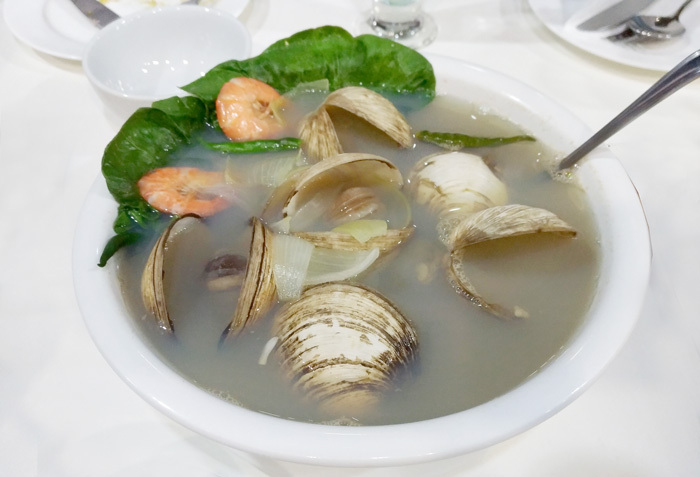 Davao’s food scene is getting exciting and interesting by the day. And I love the trend of cafes opening one after another. It’s just one way of saying we’re all good here in Davao despite all these security measures set before us. Life goes on, live, love, engage into sports, eat a lot and be merry. 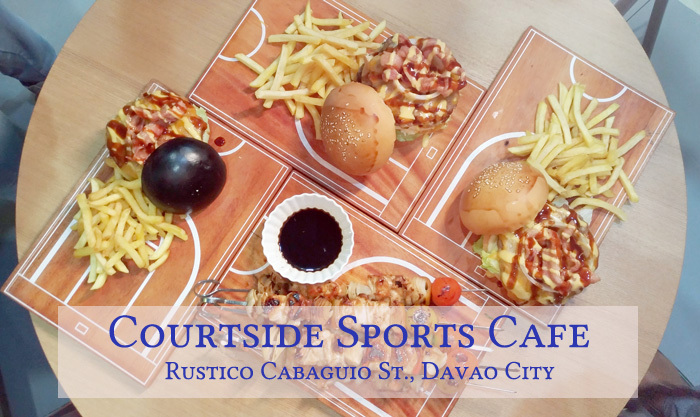 One of the latest additions to the growing list of Davao’s food destinations is Courtside Sports Cafe. Located along uncrowded Rustico Cabaguio St. in Obrero is the minimal, modern, somewhat rustic and stand-alone building of the cafe. I always picture cafes to be small with tight fit interiors and exteriors. Seeing Courtside’s towering facade made me ditch all those notions out. They also have spacious parking which is a plus-factor for most diners. The interior is just as impressive as the exterior. It has high ceiling with glass windows and amply spaced tables, fit for big-built athletes. I cannot fault even a tiny bit the owners of this cafe; they’re all architects for Christ sake. Hence, the fine idea. Props also to their most comfortable, light-weight and gray-colored chairs. 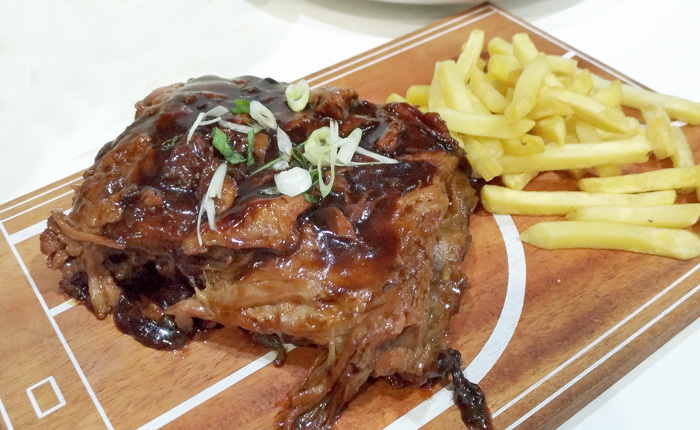 Eating in comfort is one of the elements of happy and satisfied diners and they remember that! “Ours is a family friendly sports cafe. Our intention is not the kind that serves alcohol. 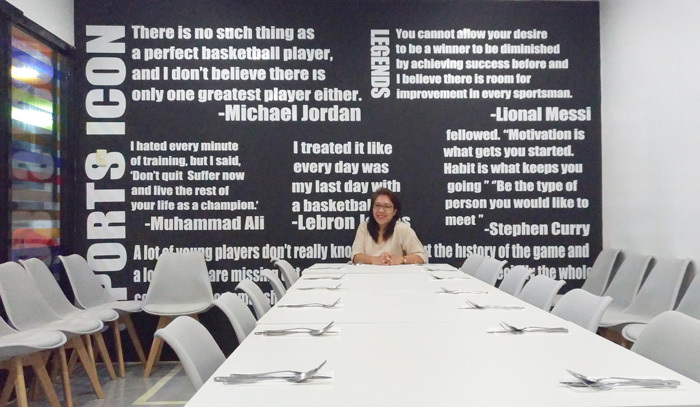 It’s a sports concept cafe, where family and friends can dine and engage into sports together. Our covered court will open very soon and this will serve as a venue where family and friends can play and dine together,” said Arch. Ryan Dennis Ortouste, Courtside Chief Executive Officer. And now to the real heart of the cafe; the food! Another notable feature of this cafe is their menu. If you’re not into sports, you’ll go off-course a little bit. The handles of their food are named after famous sports terms and names. They even serve their food in court concept boards and I like it. But whatever, whether you're into sports or not you’ll find your way home here when you’re offered food in most generous servings. 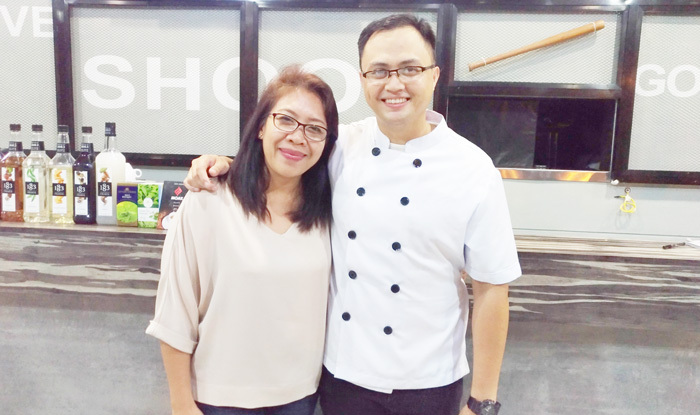 In a short chat with Chef Ralph, Courtside intend to offer food and meals that come in big servings but very affordable in price. 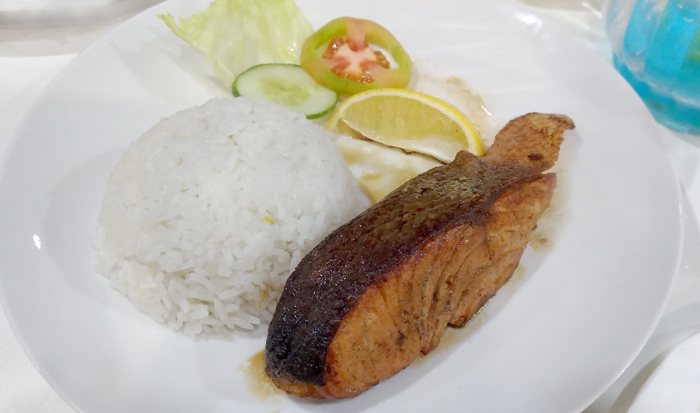 Third Quarter on the menu has Salmon Steak on it. This is the champ for me. It's pan-grilled salmon with garlic and butter. Unpretentiously delicious! I love it! This is one of the three sports termed salads. Named after the famous American basketball star, Larry Bird. 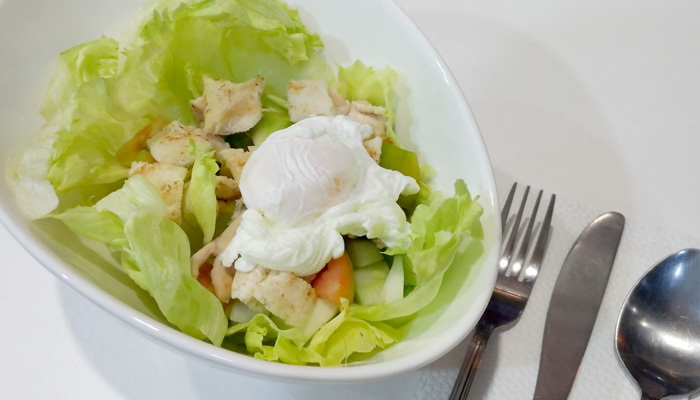 It's pan-grilled chicken fillet with poached egg. It's tossed in with romaine lettuce, tomatoes, cucumber and parmesan cheese. Named after the famed basketball star, Lebron James. It's a slow-cooked baby back ribs, basted with houseblend special BBQ sauce served with french fries and on a half court board. If you're on the hunt of the best steaks in town, you should have Courtside's version on the list. Must try! 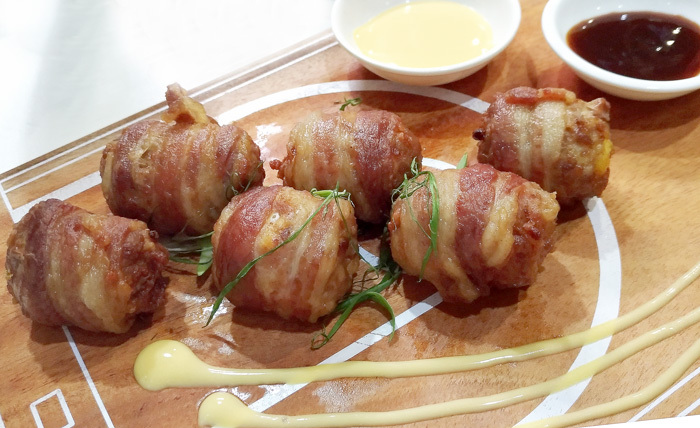 Deep-fried bacon on the outside and boiled quail eggs on the inside. This one-bite starter goodness is the bomb of the first quarter round. The marriage of flavors is so good, its a meal of its own... rice na please! No pun intended. Haha! Gosh, this is the death of me. 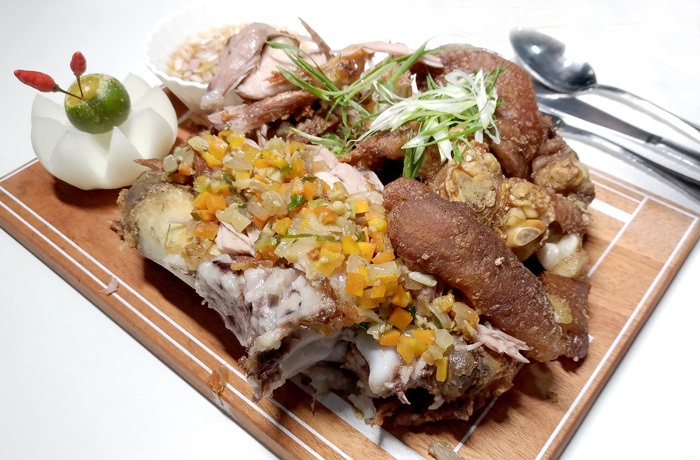 This is stuffed crispy pata made to perfection. Lami jud sya, Chef! Nahurot naman dayun oie, hahaha! We're finally on the fourth quarter and we're having burger. King of the Fourth, Slam Dunk Frankfurther's Sandwich and Hanamichi Burgers are the four irresistible choices that each can be shared for 2. Courtside also serve all-day breakfast. They have great choices to power up your day especially when you're coming from the court. 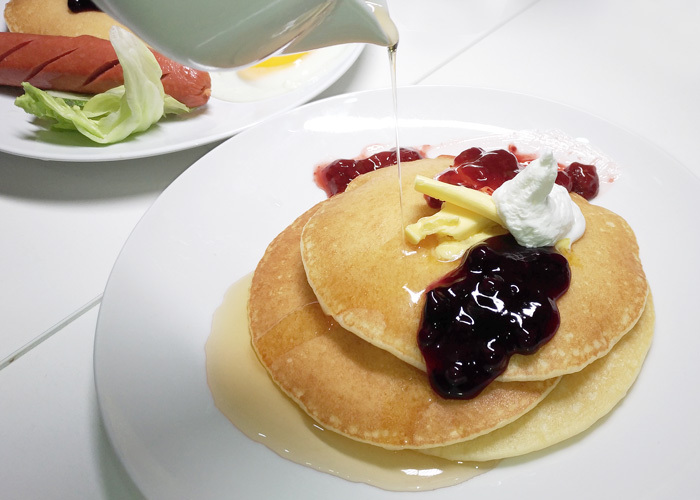 One of them is this stuffed blueberry pancake. We were so overwhelmed by the food what were served to us and unknowingly we've put this aside. After all the dust has settled and we're all winding down, we relocated this plate and munched on it. Surprisingly, even if it is not warm anymore it still so fluffy and soft. Chef's note has it that their pancake mix is housemade and has gone through weeks of trial and error, hence it comes out first-rate and Courtside perfect. 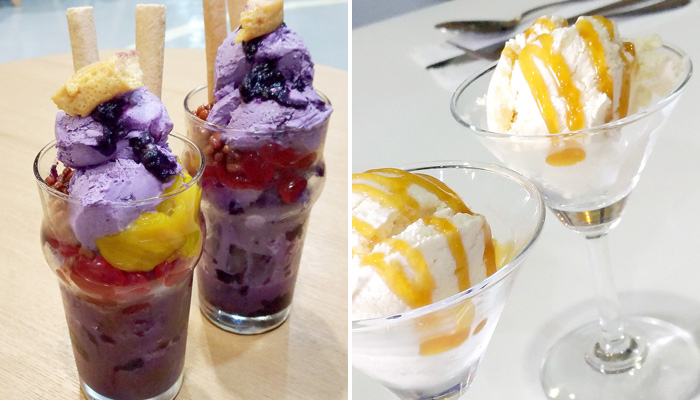 (L) Handcrafted halo-halo ice-cream (R) Homemade salted caramel ice-cream, so good! With Chief Operations Officer, Resident Chef and a good friend, Ralph Shotwell. Congratulations, Ralph! I'm proud and so happy for you, my friend! Finally, Courtside is real! (L-R) Peter Paul Galinea, VP for Operations. Ralph Shotwell, Chief Operations Officer & Resident Chef. Arch. Ryan Dennis Ortouste, Chief Executive Officer. It's written on the wall. Words to live by from great sports icons of our time. Courtside has also air-conditioned function room that can accommodate up to 20 persons. Rate as of posting is P3,000 consumable. 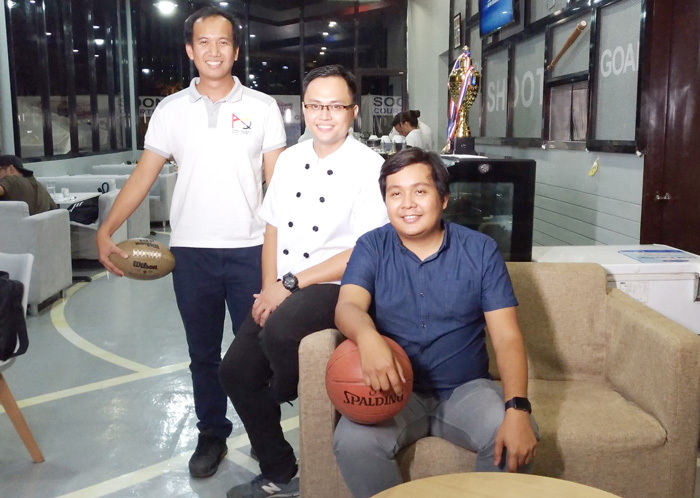 Courtside is also set to open their covered court before the year ends. It's a full basketball court that can also double as badminton and or other sports court. Courtside also intends to host basketball leagues and sports tournaments in the future. This facility will complete the character of the cafe being it a wholesome sports cafe in Davao City. 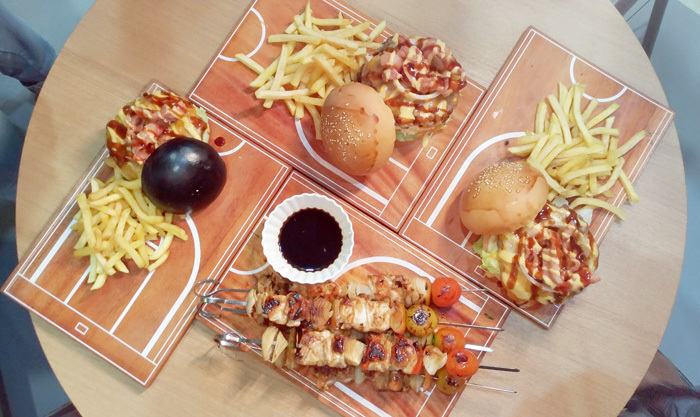 Courtside Sports Cafe is not only a sports-oriented food destination with innovative, appetizing, generous servings and affordable food choices. But also a cafe that advocates clean and wholesome sports concept cafe in the city. It's a perfect place for family to bond over sports and food. For friends to have fun and indulge after. And also for non-sporty too to just chill and enjoy good food.